CVCA is happy to announce our Pet of the Month calendar contest winners. Thank you to everyone who submitted a contest entry. We received hundreds of entries, making the choice very difficult, indeed! Each of these special dogs will be featured in our 2018 calendar that will be available for purchase at our CVCA offices soon! Be sure to check out the final page for a special collage of many of our other contest entrants! CVCA diagnosed Wilson with cardiomyopathy after a horrible life in Texas. We got him three weeks earlier from a rescue. Now that he’s on medicine, Wilson’s a whole new dog and loves to play with toys. Dr. Emily Olson, in the CVCA Richmond, VA office, is amazing and Wilson is so thankful for her because he can now enjoy life. Because of CVCA’s care, compassion, knowledge, and current technology, our sweet Remy was able to celebrate her 10th birthday surrounded by her family and loved ones in style! Charlie was so little when we brought him to CVCA that I was nervous for him. When we walked into the CVCA Towson, MD office, the staff was amazing and so kind. They made me feel better and made Charlie feel so loved. I left feeling much better about Charlie’s condition and relief knowing he has a wonderful place to go to for care. Thank you, CVCA, for all you do. Gucci got his life back AFTER his CVCA appointment! I went into CVCA not knowing anything about what I was getting into & expecting the worst. My Gucci, my world in a 20 lb. canine, “possibly” had an aneurysm of the heart, on top of already being treated for an enlarged heart for years per his prior vet. I cried & held him so tight for days until we got in at CVCA. All I could think of was how much I couldn’t be without him, and “Why us?” CVCA confirmed that there was nothing wrong with his heart AT ALL. I had never been so confused, yet so happy in my life!! CVCA not only confirmed my worst fears were wrong, but gave Gucci back his life. We went for a long hike after that day and he has been nothing but excited to be able to be more active. CVCA has given Jinn and me the chance to extend our quality time, the ability to feel good, and SEIZE THE DAY! Every day we are living life to the fullest. CVCA goes above and beyond to make sure Dobby’s dilated cardiomyopathy is always under control, as well as it can be. Without CVCA, he wouldn’t be here today. CVCA has allowed my family the opportunity to love on Jesse for years to come! He went to CVCA with a Patent Ductus Arteriosus (PDA) and a short life span if we didn’t have surgery to repair it. Jesse’s heart was oversized and working double time. He did great with surgery and now loves on all he comes across. CVCA may have repaired his large heart physically, but emotionally his heart is huge! The boy loves life! CVCA staff is wonderful and caring and we always receive wonderful service! We love Dr. Weidman and the Richmond, VA staff!!! CVCA staff is courteous, knowledgeable and provides excellent care. Isabell Marie is my first-born fur child and love of my life, so when she was diagnosed at age 7 with Patent Ductus Arteriosus (PDA), my heart just broke. The amazing staff at CVCA in Annapolis, MD helped us from start to finish. From routine monitoring upon diagnosis, to having a surgical intervention when she was 10 years old, to rechecks afterward. They are always fast, efficient, and most importantly—caring. Isabell Marie is celebrating her 14th birthday and she is a happy, and healthy pup living her happy life, thanks to CVCA! Our baby girl, Chula, was rescued from a puppy mill and was born with a heart murmur. CVCA in Towson, MD performed surgery to implant a canine ductal occluder to normalize the blood flow to her heart. Today she’s a happy and healthy puppy! Following open-heart surgery, our veterinarian was called to tell her Bongo made it through with flying colors. My veterinarian said no other veterinarian ever called her to celebrate good news. 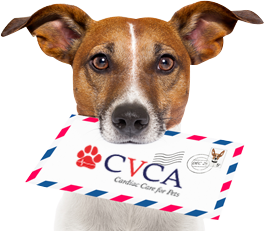 The staff at CVCA helped put my mind at ease by getting my pet insurance pre-authorization on the surgery. The staff goes the extra mile to make you feel special. Congratulations to these special pets and their owners! We are happy to be a part of so many life-saving stories every year. The love we have for our pets knows no bounds and CVCA is here for you and your pet whenever you need us. Happy holidays and best wishes for a happy and healthy new year!